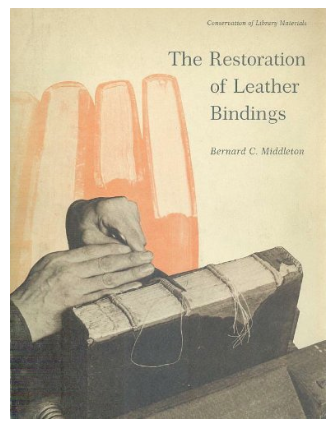 When I attended the Bookbinding 2000 Conference, I thought it might be Bernard C. Middleton’s last hurrah. After all, he had brokered the transfer of his extraordinary collection of books about bookbinding to Rochester Institute of Technology’s Wallace Library Cary Collection. He was 75 years old. He had written two of the most influential books on the craft of bookbinding in the 20th century. The elegant hands (his?) on the cover of the Restoration of Leather Bindings possibly inspired more of us to enter the is field than any of his writing. The bindings I’ve handled of his have been exemplary. What was left to do? Fifteen years later, we have another book, consisting of three new essays and nineteen previously published ones. Most appeared originally in Paper & Print, The British & Colonial Printer, Printing World, and The Book Collector in the 1950’s, but all were new to me. This is another essential book, written in Middleton’s straightforward style and packed with observations on forwarding, finishing, and the state of the craft in general. This book pairs nicely with his indispensable History of English Craft Bookbinding Technique, because it does deal with technique, while despite the title, his History primarily concerns structure. Technique is an elusive beast. Only traces of it remain in artifacts, and it is often difficult to understand how a particular action was accomplished, even if one can arrive at a similar looking result using current tools and techniques. But understanding and interpreting historic subtitles are essential for understanding the evolution of any craft. This is precisely why A Bookbinders Miscellany is so important: it is a first hand account (and quite often critique) of fine, trade, extra, craft, restoration, and art binding techniques in the mid-20th century. It is invaluable to gain insight into what binders were doing and discussing, especially if it is now considered dated from our current, conservation oriented approach. The book also records the tension between art school training, with its emphasis on design, and a decline in craft trade binding skills in the post WW2 era. Bookbinder Sam Ellenport’s introduction situates the book within this milieu. For readers not so interested in binding history or design philosophy, this book also contains many practical tips for full leather binding. “Notes on The Art of Covering with Leather”, and “Notes on the Hand Sewing of Books” both contain extremely useful how-to information. “The Supported French Groove” details this often forgotten binding which combines advantages of the case and in-boards binding. In possibly his most personal essay, published for the first time, “Old vs. New: A Division of Interest”, Middleton reflects on the nature of design, restoration, disorganization, and the value of dirt in his bindery. He considers his professional life “… a muddle — a muddle which, though it constantly exasperates me, certainly provides a wealth of interest.” (p. 106) Frankly, it is hard to consider this scholar and craftsman’s career anything close to a muddle, and I hope this is just an example of English self-deprication. So why is this excellent and informative limited edition book priced so low? Come on, for all Middleton has given during his life, can’t we give a little more back to him? If bookbinders do not value the physical book, can we expect anyone else to? “Bookbinding is a challenge — a challenge to our skill and our intellect. To master this craft is to master many things. True mastery has yet to be achieved, but we must all press forward in the endeavor to create the nearest approach to the Book Perfect.” (p. 44) Middleton is realistic when describing the present state of binding, but retains hope for the future. I’m inspired to do the same. Available from Alan Isaac Rare Books.